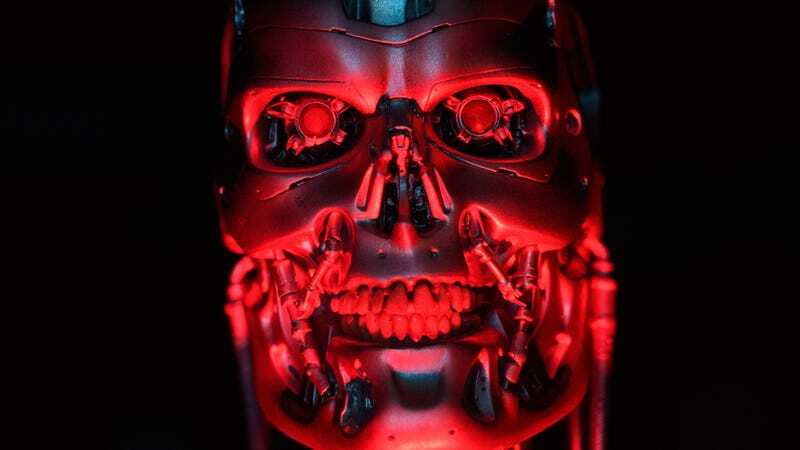 Tim Miller’s new Terminator movie—which we’re just going to go ahead and keep thinking of as James Cameron’s new Terminator movie (sorry, Tim), since it’s his first trip back to the franchise since striking cybernetic gold with T2: Judgment Day—is already building up a steady buzz of excitement for itself. There’s Cameron’s involvement, obviously, and Deadpool director Miller getting to play around in one of sci-fi’s biggest, most poorly maintained playgrounds. And honestly, we’re mostly just excited to see Linda Hamilton running around kneecapping people again. Still, we now have another potential highlight for the November release: The ability to talk about it without having to wrap our mouths around nonsense words like “Genisys”, for once. This is per Yahoo, which reports that Cameron has let slip the working title for the sixth film in his and Gale Ann Hurd’s sprawling sci-fi franchise: Dark Fate, a reference to the series’ obsession with dystopia, apocalypse, and destiny, and also, presumably, to a sort of all-purpose general spookiness. (It does come out the day after Halloween, after all.) Now, this is just a working title, but still, the lack of extraneous “y”s at play here really does our hyarts some gyod. Cameron—taking time out of his busy schedule of idly wishing new Avatar movies into the world—also made a lot of noise about “passing the baton,” noting that both Hamilton and Arnold Schwarzenegger are both participating, to some extent, in order to get some new young people to take this damn franchise off their hands once and for all.